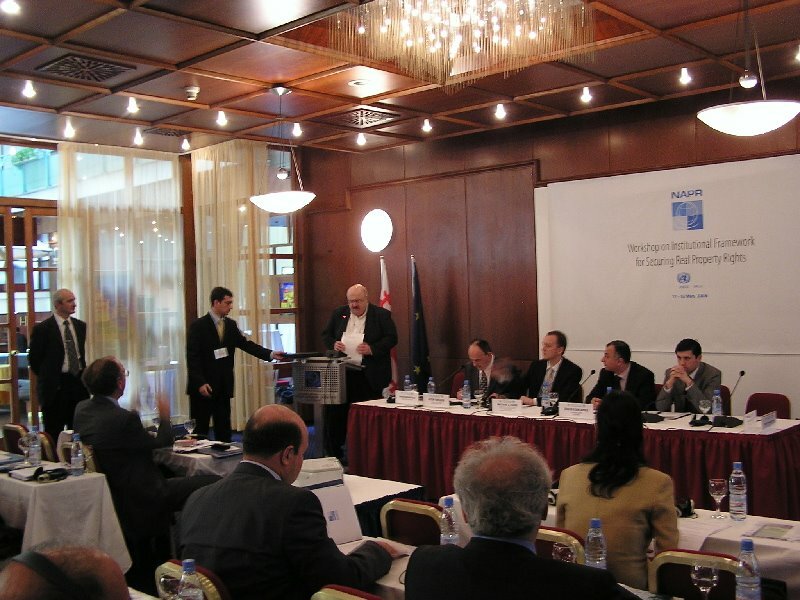 More than 120 experts from 26 countries participated the largest ever international land-related event in Caucasian Countries and Central Asia held in the Georgian capital Tbilisi between 11-12 May, 2006. FIG President Prof. Holger Magel, UNECE WPLA Bureau members with Chair Peter Creuzer and representatives of 8 international donor organisations were attracted by the showcase of Georgia, Azerbaijan, Armenia and Tajikistan. Lithuania, Mongolia, Turkey were also presented. As advanced Western European approaches the improved customer service of Scotland and the Dutch On-line Kadaster were introduced. Hosted by NAPR Chairman David Egiashvili, keynote speech of the event emphasizing the role of transparent and effective land management in the economic development context was delivered by Kakha Bendukidze, State Minister of Georgia. Leaflets on the Hungarian institutional framework in land management supervised by MoARD DLAG and the organised spatial data interest community HUNAGI was disseminated among the participants.